I’ll never forget the feeling I had when I lost my first client. I was 24 years old, new to the inbound marketing game, and it hit me like a brick wall. I was blindsided, which meant my boss was blindsided, and I felt like I let the whole company down. I’ll never forget the feeling -- but I’ll also never forget the lesson I learned. Though I talked to my client every other week, I wasn’t truly listening to them. I didn’t hear their concerns with our marketing strategy or that she was under a lot of pressure and stress from her department lead. As most business owners have learned, it costs 6-7x more to acquire a new customer than it does to retain one. So, how can we ensure we keep our customers around? Below, I’ll walk you through my tried-and-true customer retention steps from lessons I’ve learned over the years. Talking to your customers seems like a no-brainer, and yet, not everyone is doing it! I’ll be the first to admit it, getting feedback is not going to be comfortable. Though you may hear some harsh criticism, I guarantee you will also learn something new that helps you improve your performance. So, what are the best ways to get customer feedback? And how can you increase your chances of past customers actually answering you? Send an open-ended question to a customer that has canceled to learn why. 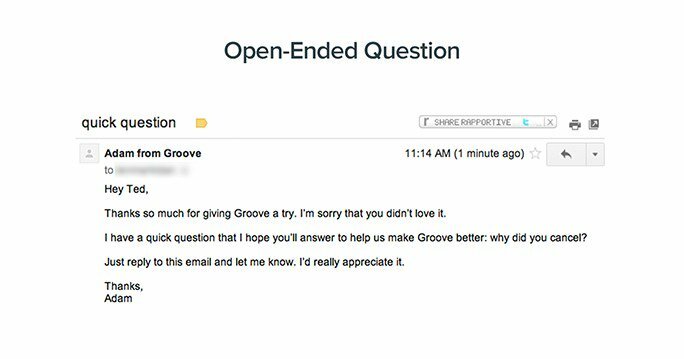 You don’t even need to rely on a survey service, simply send an email like the team at Groove. When the company previously sent an exit survey, it only saw a 1.3% completion rate -- pretty low considering all the effort. So they rethought their approach. Groove even A/B tested the email to see what verbiage most resonated with recipients. The result? When asking “what made you cancel” instead of “why did you cancel,” the team saw a 19% response rate. Instead of (or maybe even in addition to) sending an email, create a plan to regularly interview your customers -- and here’s the kicker, record it. This way, you’re less likely to misinterpret or misquote the feedback and you’ll have it handy for future reference. You can send the recording to anyone at your company so they can physically hear the feedback coming from the customer themselves, not just take your word for it. A great tool to use is NoNotes. 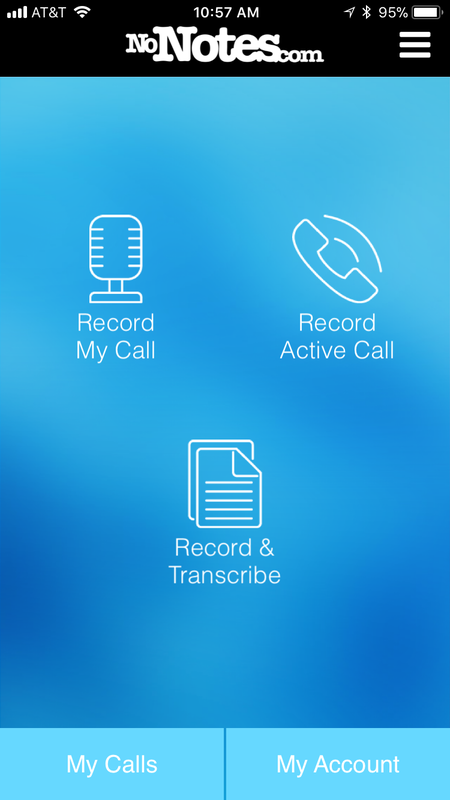 It offers both call recording and transcribing so it can save you time and allow you to focus on the conversation instead of jotting down notes during the interview. One crucial point though, never forget to tell your customer that you’re recording them. People are becoming more accustomed to interacting with chat boxes on websites and the functionality is quickly becoming a necessity for companies with 51% of consumers saying a business needs to be available 24/7. Now, notice I’m recommending you install a live chat function and not a chatbot (at least not year). Though chatbots can be great, incorporating a live chat will allow you to keep things personal and more human as you engage with customers. Both the HubSpot Messages feature in SalesPro and Drift are awesome options to consider. With them, you can select specific pages for the chat box to appear, so include it on a client login or customer support page to better serve your customers’ immediate needs. 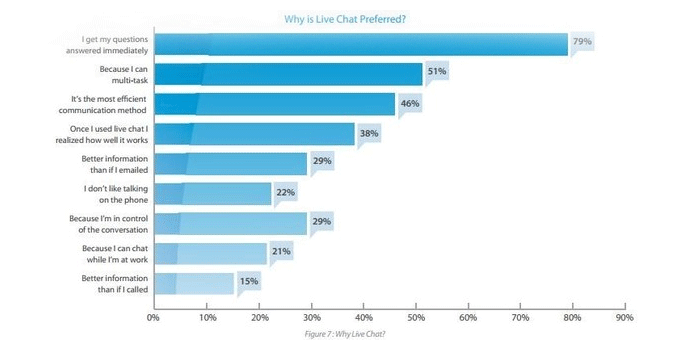 That is, after all, why 79% of customers say they prefer live chat. HubSpot Messages also connects directly with the HubSpot CRM so if your sales team owns a contact, the chat can automatically show the customer’s HubSpot owner instead of a different team member. This helps keep the customer’s experience consistent and allows the sales owner to gather valuable insight. Believe it or not, forums are not dead. Even though they’re one of the oldest solutions for acquiring feedback, forums provide any easy solution for you to get new ideas on how to improve your service or product. For example, did you know the Starbucks Rewards program got started based off of a customer’s input on a forum? The coffee giant already had the standard card system in place that most coffeehouses provide, but one customer’s comment sparked a great idea -- create a point system and reward customers based on the number of points (or purchases) they have. HubSpot does something similar. In its HubSpot Ideas forum, customers can submit ideas on ways to improve its solution or new functionality and features they want to see. Then other customers can vote on the ideas they like and the more votes an idea has, the more likely it is to catch the eye of the developers and enter a beta stage. It’s another great example of how to hear your customers’ needs. Here at IMPACT, we track a Net Promoter Score, or NPS, for each customer every other week. At first, it felt a little forced, but over time it became part of our routine. So much so, that we even revamped our agenda templates to include it as a line item of something to discuss and our customers have come to expect it. We ask for a quantitative score, on a scale of 0-10, to see how things are going around questions like: How likely are you to recommend our business to a colleague or friend? How happy are you with our current performance? After receiving the score, we then ask for the qualitative information: What could make it a 10? Where is the biggest area we can improve? How else can we be helping you succeed at your job? The number score is great to gauge where we stand, especially for those that do not talk to our customers every single day like our Director of Client Services, COO, and even CEO, but the follow-up questions are where the real magic can happen. With those, you’re able to truly understand what the customer is thinking and can adjust your service or communication to best fit their needs. Whether it’s answers from an email prompt, insight learned through interviews, questions asked on a live chat, or honest criticism on how you can improve your relationship, the feedback you gather will give you a bank of information on how you can improve. Now it’s time to take what you learned and apply it to improve your customer retention and services. We already established that customers are looking to get their questions answered. What if you could answer them before they even asked? Creating a customer-focused webinar series will allow you to do just that. Take the most common questions you received during the feedback phase and tackle them throughout the year with webinars dedicated to customers only. 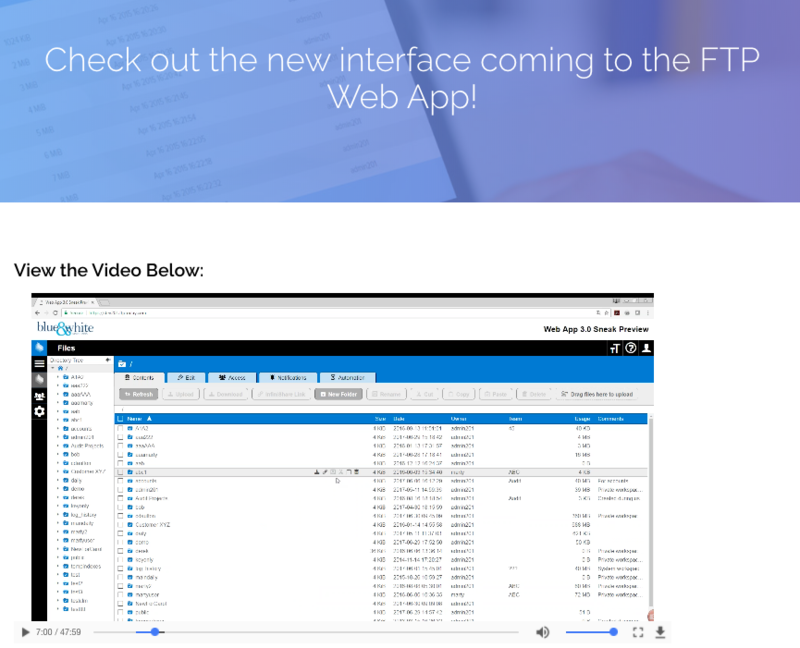 Afterwards, you can even repurpose the webinar recording so future customers can find the information they are looking for without ever needing to reach out to you. This is a great way to also announce software updates, new product releases, and industry trends. Another great opportunity to answer your customers’ questions is through training videos. Solutions like Soapbox or Loom allow you to easily record your screen and give quick “how to” tutorials. No complex video recording tools needed. A current IMPACT client, TRUPOINT Partners does this after receiving questions on their live chat. The sales person spends a quick 1-2 minutes filming an answer and chats back or emails the link to the customer can see exactly what steps to take within their software. Though this seems like an obvious suggestion, establishing loyalty or rewards programs is not often followed through with. In fact, 66% of small businesses don’t have a loyalty program. If you’re considering one (which you should), start with your most loyal and frequent customer. Go through the feedback steps and see what is working and why they continue to need your business above others. Offer a discount or a bonus solution for resigning year over year. Customers will appreciate the incentive for continuing to do business together. The company helps provide clean water access, improves maternal health care and partners with organizations like the Wildlife Conservation Society. 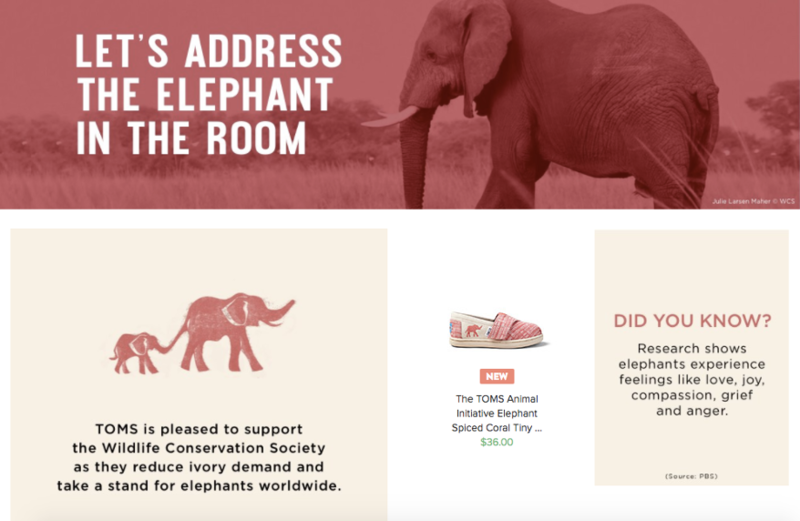 Capitalizing on customers’ shared beliefs and values has enabled Toms to stay front of mind with its audience. If there is one thing you take away from this article, I hope it’s the importance of being human. The number one reason for customer loss is that he or she feels poorly-treated. Read that again. It’s about their experience and how they feel; not your product. If you can’t connect in some way on a human-to-human basis then you are going to continue to churn customers. People want to feel valued, so take a human approach. Listen to their needs, ask them questions, and be up front in answering their questions or concerns, even if the feedback hurts to hear. Some customer loss may be inevitable but following the above steps has helped me retain customers for years and can help you too. 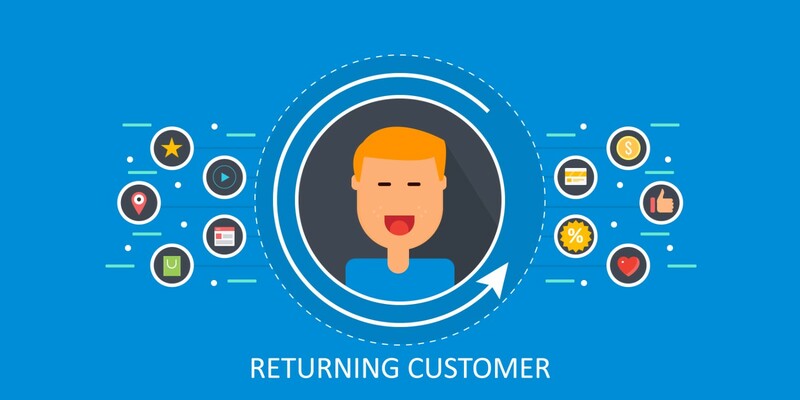 What are some tactics you’ve used to help retain customers? I’d love to hear them in the comments below!